The pathology of diseases such as Pierce’s disease (PD) of grapevine (Vitis vinifera L.) that are caused by the xylem-limited bacterium Xylella fastidiosa (Xf) is widely attributed to vessel occlusion and subsequent water deficits. 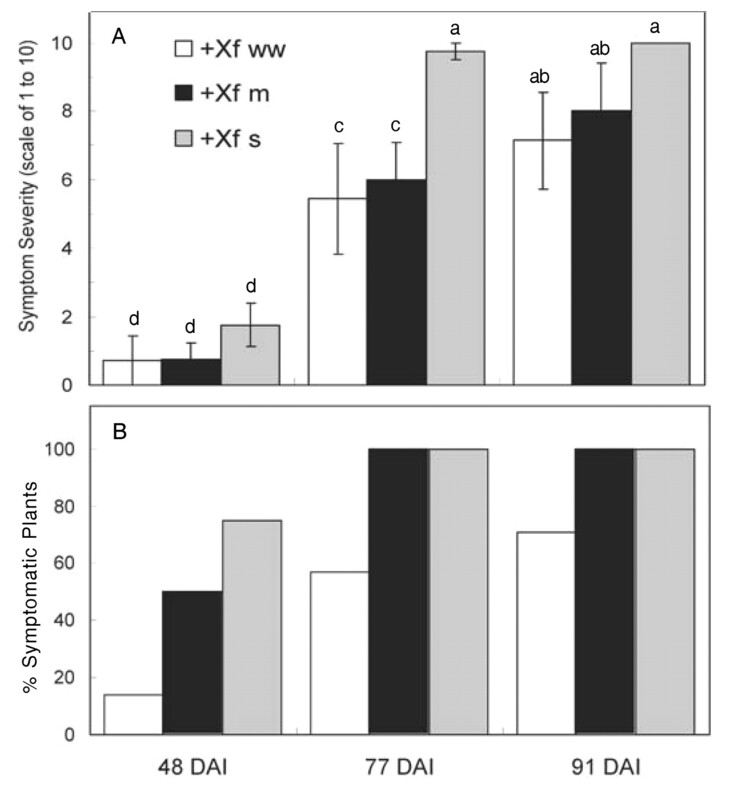 Grapevines (Vitis vinifera L. Chardonnay) were exposed to water deficits, stem inoculation with Xf, and combinations of both to evaluate whether symptoms of PD were a consequence of water deficits. When vines were inoculated with Xf and exposed to water deficits, more extensive PD symptoms developed throughout the plant than when infected vines were well watered. However, vines infected with Xf exhibited symptoms unique to PD that included inhibited periderm development in stems (green islands), leaf blade separation from the petiole (matchsticks), and irregular leaf scorch. Vines exposed to water deficits and not Xf displayed accelerated periderm development, basal leaf abscission at the stem/petiole junction, and uniform leaf chlorosis. Water deficits induced the development of an abscission zone at the stem/petiole junction, but PD did not. Pierce’s disease symptoms could not be produced with any of several water-deficit treatments, including severing all but one secondary vein near the leaf tip. Results indicate that factors other than water deficits are involved in producing the symptoms of PD. The widely accepted hypothesis that PD-infected plants develop water deficits that cause green islands, matchsticks, localized leaf scorch, and eventual death of vines should be reevaluated. Pierce’s disease (PD) is capable of destroying entire vineyards, resulting in great financial losses (California 2004). The disease is caused by the xylem-limited bacterium Xylella fastidiosa (Xf), transmitted by an insect vector (Goheen et al. 1973). The overwhelming consensus among researchers is that the fatal nature of PD is a result of the bacteria becoming systemic, blocking xylem conduits, and causing water transport to become progressively impaired (California 2004, Goodwin et al. 1988a,b, Goodwin and Purcell 1992, McElrone et al. 2001, 2003, Newman et al. 2003, 2004). Although it is clear that in vines with PD, xylem vessels become occluded by bacteria, tyloses, and/or gums (Mollenhauer and Hopkins 1976, Stevenson et al. 2004b), most research has addressed xylem occlusion by the bacteria (Newman et al. 2003) and attributes PD symptoms to restricted water transport. At the time of this publication, websites on PD at the University of California, Davis, Texas A&M University, and the University of Florida all carry this same interpretation, attesting to the nationwide extent of this view. Indeed, Pierce’s disease has become nearly synonymous with plant water deficits. This view is largely based on correlative evidence. Hopkins (1989) showed a strong association between reduced water conductance in stems of citrus seedlings and Xf-caused disease symptoms. Low leaf water potential and turgor, impaired hydraulic conductance, and higher stomatal resistance were correlated with PD symptoms in grapevines (Goodwin et al. 1988a). While reduced leaf water potential, stomatal conductance, and stem hydraulic conductivity are characteristic of water deficit, these same features also occur in flooded plants (Kramer and Boyer 1995). In grapevine, typical visual symptoms of PD are “green islands” (areas of green epidermis on an otherwise brown stem), patchy or marginal leaf necrosis (often called leaf scorch), and “matchsticks” (petioles that remain attached to the stem after the laminae have fallen off) (Purcell 1986, Goheen and Hopkins 1988, Stevenson et al. 2005). These symptoms are not characteristic of water deficit symptoms in grapevines (Williams and Matthews 1990). Water deficits are implicated as a factor in the development of PD and other Xf diseases. Citrus trees already infected with Xf and subjected to drought displayed accelerated symptom development of citrus variegated chlorosis (Gomes et al. 2003). Extended water deficit also increased the severity of PD in the woody liana, Virginia creeper (Parthenocissus quinquefolia) (McElrone et al. 2001, 2003). Thus, extended water deficit (such as drought) may exacerbate the development of PD symptoms in grapevine as well, and it has been suggested that water-stressed grapevines in the field are more susceptible to PD than are well-watered vines (Hopkins 1989). However, there are no reports describing the effects of water deficit on Xf-infected grapevines. Therefore, it is important to determine which PD symptoms, if any, are a result of water deficits and what role water shortage actually plays in symptom development and vine death. Thus, our objectives were two-fold: to determine whether water deficits could produce the symptoms of PD in otherwise similarly cultured plants and to evaluate the impact of vine water status on the development of the symptoms of PD. Three-year-old grapevines (Vitis vinifera L. cv. Chardonnay grafted onto Richter 110 rootstock) were grown in 8-L plastic pots of GrowCoir (Houston, TX) potting mix in a greenhouse (30°/20°C ± 3°C; 40/70% ± 10% RH; natural light with a daily maximum of ~1200 μmol photons m−2 s−1 PAR). The vines were pruned to two shoots, and the shoots were vertically trained. Vines were watered daily with 280 mL of nutrient solution (0.11 g/L of GrowMore 4-18-38, boron removed) unless indicated otherwise. For experiments with PD, each plant was needle-inoculated with 60 μL of Xylella fastidiosa (Xf) (infected) or deionized water (uninfected) above the seventh node of the upper shoot. For each 60 μL inoculation, a 15-μL drop of Xf solution (108 cfu) or deionized water was placed on the surface of the stem at the same internode, and a 27-gauge hypodermic needle was pushed through the droplet and into the stem. Upon removal of the needle, the liquid droplet was rapidly drawn into the stem. This procedure was done four times, with each inoculation point 90° horizontally around the stem from the other. Rapid uptake of the droplets indicated direct entry into at least one xylem vessel. Those vines inoculated with Xf tested positive for the presence of the bacteria; treatments inoculated with water or not inoculated at all were negative for Xf using PCR performed by Agri-Analysis (Davis, CA). Grapevines were subjected to three daily watering regimes: well-watered (ww; 600 mL), moderately water stressed (m; 335 mL), and severely water stressed (s; 200 mL) in a greenhouse for 91 days from the time of inoculation. Additional, non-inoculated plants were subjected to rapid water deficit by removing the water source and allowing the soil to dry for nine days. Seven or eight plants were maintained for each treatment. Evaluation of the visual PD symptoms was based primarily on leaf scorch, which was the first of the characteristic PD symptoms to appear. Symptom assessment had two components. One was the percentage of plants per treatment showing leaf-scorch symptoms; the second was to assess the severity and extent of leaf scorch over time and, as symptoms progressed, matchsticks. To quantify the severity of PD symptoms, each plant was assigned a number based on a scale from 1 to 10, where 10 was the most severe and represented at least some degree of leaf scorch on all fully developed leaves on the inoculated upper cane as well as the presence of matchsticks at more basal nodes on the same cane. The appearance of leaf scorch on the lower cane, which had not been inoculated with Xf, was also determined. The presence of green islands was evaluated at 91 days after inoculation (DAI), at which time both canes of each plant were examined and the number of green islands per plant was recorded. The development of periderm was estimated from visual observation of “cane ripening,” the distinct change in stem color from green to brown that is indicative of periderm development (Moore et al. 1998). Plant water relations were evaluated by measuring stomatal conductance, transpiration, and plant water potential near midday. Stomatal conductance and transpiration were measured on the abaxial surface of grapevine leaves using a steady-state porometer (model LI-1600; LI-COR, Lincoln, NE). To obtain plant water potentials, plastic bags were placed over leaves for 10 min to allow leaf and stem water potentials to equilibrate (Buchner et al. 2003). Leaves were then cut at the petiole with a razor blade and immediately placed into a Scholander-type pressure chamber for water-potential measurements. Stomatal conductance, transpiration, and water potential were measured on three to four experimental leaves at equivalent shoot positions on each plant (each plant had approximately 40 leaves). Three plant averages were then combined to obtain a treatment mean. To determine whether leaf scorch could be due solely to blockage of vessels, veins of attached leaves were severed along the midvein such that only one secondary vein supplied one-half of a leaf with water. The leaves were then monitored for leaf-scorch symptoms under conditions of low to high evaporative demand. For the microscopic anatomical studies, plant tissue samples were dissected, fixed in formalin, acetic acid, alcohol solution, and dehydrated through an ethanol series (Ruzin 1999). The samples were then infiltrated with Hemo-De and subsequently Paraplast Extra paraffin using a Leica TP 1020 automatic tissue processor, embedded using a Leica EG 1160 paraffin embedding center, and sectioned at 10 μm with a Micron HM 304E rotary microtome. Sections were stained following the Johansen’s safranin and fast green protocol (Ruzin 1999). Prepared slides were viewed with an Olympus Vanox-AHBT compound light microscope and images were captured in digital format with a Pixera 600ES camera. All other images were taken with a Nikon COOLPIX 995 digital camera. Data were analyzed using analysis of variance (ANOVA) and means were compared with Fischer’s LSD (least significant difference) test at the p = 0.05 level. Comparison of visual symptoms of water deficit and PD. To determine whether PD symptoms are a direct result of water deficit, the visual characteristics of well-watered, moderately water-stressed, and severely water-stressed grapevines that had been inoculated with water (uninfected) were evaluated. Leaves of the uninfected well-watered grapevines remained turgid and healthy throughout the course of the experiments (Figure 1A⇓). The leaves of the plants receiving low but regular amounts of water (moderate and severe water-stress treatments) also remained turgid during the course of the experiment. Drooping tendrils were the first indication that the water-stressed plants were experiencing moderate or severe water shortages. The water-stressed uninfected vines gradually developed leaf chlorosis in a fairly uniform pattern over the entire lamina (Figure 1B-D⇓), with the veins staying green until leaves became necrotic. Leaves remained attached to the stem even after the leaves were apparently dead (Figure 1D⇓). Time course of water-stress symptom development of leaves of uninfected Chardonnay grapevines. (A) Leaves were green and turgid before the onset of water deficit. (B) As vines became water stressed, leaves became chlorotic. (C) Extensive and uniform chlorosis developed as water deficit continued. (D) Water-stressed leaf blades and petioles eventually became necrotic; dead leaves remained on the stem. 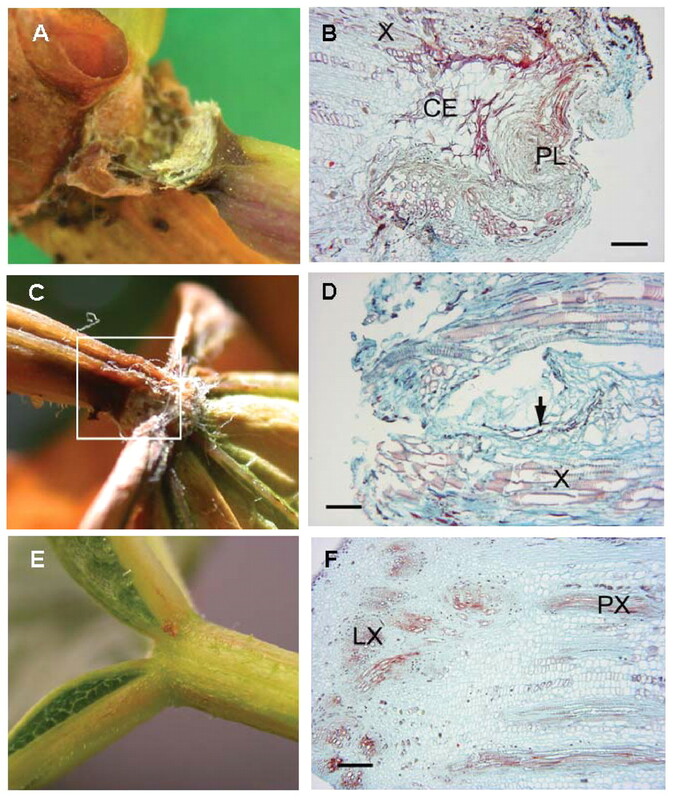 In uninfected water-stressed plants, two sites of constriction and necrosis developed on petioles, one at the stem/petiole junction (the basal end of the petiole) and the other at the petiole/lamina junction (the distal end of the petiole) (Figure 2A-D⇓). At the basal end of the petiole, an abscission zone formed (Figure 2A, B⇓), as identified by the development of a region of cell enlargement and a protective layer (Figure 2B⇓). The region of cell expansion was determined by its distinctly large, thin-walled cells, whereas the protective layer was distinguished by cell collapse and likely suberized cell walls. At the distal end of the petiole where the lamina is attached, the tissue constricted and concurrently became necrotic (Figure 2C, D⇓). Observations at the cellular level suggested that the constriction and necrosis at this junction is not an actual abscission zone. Neither the abscission zone at the stem/petiole junction nor the fracture zone at the petiole/lamina junction developed until the leaf blade was severely chlorotic. Two sites of constriction and necrosis form on a petiole during water deficit. An abscission zone (A, B) developed at the stem/petiole junction. At the petiole/leaf blade junction the tissue constricted and concurrently became necrotic (C, D) during water deficit; however, no abscission or constriction occurred in nonstressed healthy plants (E, F). (B) 4x magnification; longitudinal section through the separation layer of the basal (stem) end of an abscised petiole from a water-stressed vine. X: xylem, CE: region of cell enlargement, PL: protective layer, scale bar: 0.25 mm. (D) 10x magnification; longitudinal section through the distal (leaf blade) end of a petiole from a water-stressed plant (see boxed area in C). No separation layer is present near the fracture area. Arrow indicates possible early formation of a protective layer. X: xylem, scale bar: 0.1 mm. (F) 4x magnification; longitudinal section through petiole/leaf blade junction of an intact leaf showing transition between petiolar xylem and xylem of the leaf blade including anastomosis into the five major leaf veins. PX: petiole xylem, LX: leaf blade xylem, scale bar: 0.25 mm. The shoots of water-stressed plants matured faster than well-watered plants, based on the extent of periderm development up the shoots (data not shown). The rate at which this cane ripening progressed up the shoots was not different between moderately and severely water-stressed treatments. 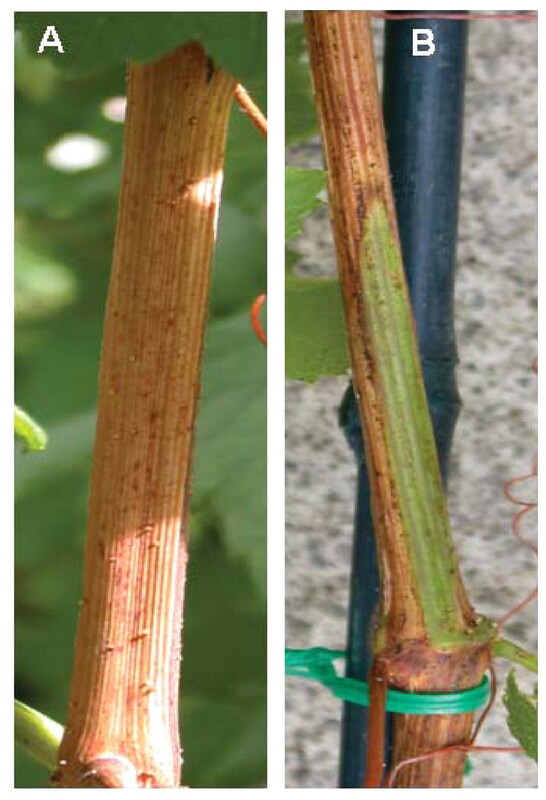 Uninfected vines with moderate and severe water stress showed the same symptoms of water deficit; that is, increased periderm development up the shoots, constriction and necrosis at both petiole ends, and uniform leaf chlorosis followed by necrosis with leaves remaining attached to the shoot. Leaf symptoms developed more quickly in the severely stressed plants than in the moderately stressed vines. While the visual characteristics of plants experiencing either moderate or severe water deficit differed only in the number of leaves affected, the visual characteristics of plants that rapidly dried were distinctly different from those of the other water-deficit symptoms. 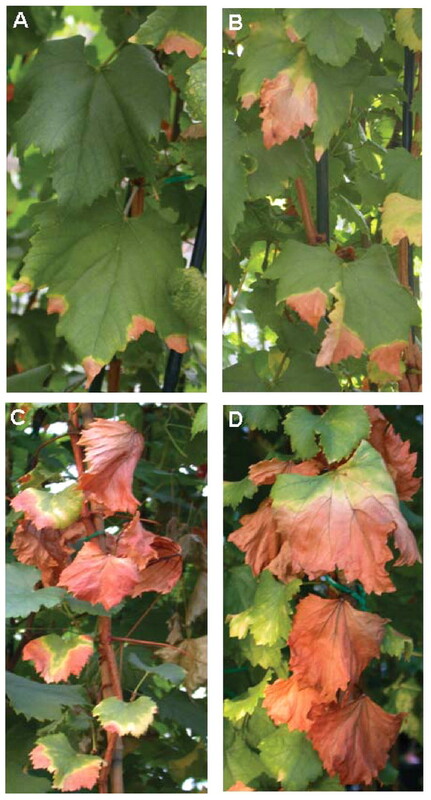 Non-inoculated grapevines from which all water was withheld wilted quickly, starting with the tendrils, then summer laterals, followed by the leaves (Figure 3A⇓). Unlike the slow water deficit of the moderate and severe treatments, the leaves and petioles of rapidly dried vines remained green as they desiccated (Figure 3B⇓). An abscission zone at the stem/petiole junction and an area of constriction and necrosis at the petiole/lamina junction developed simultaneously and before the leaves developed chlorosis (Figure 4A-C⇓). Similar to the other water-deficit treatments, the leaves remained on the stem until a disturbance caused them to fall. When the leaves did fall, they came away at the stem/petiole abscission zone (Figures 3B⇓ and 4A⇓). None of the stems of uninfected vines—whether well watered, with extended water deficit, or with rapid water deficit—formed green islands (Figure 5A⇓). Uninfected Chardonnay vines from which water was withheld. (A) Wilting started with the tendrils, then summer laterals, followed by the main stem leaves. (B) Leaves and petioles of rapidly dried vines remained green as they desiccated and detached from the plant at the stem/petiole junction after nine days without water. (A) Necrotic areas at both ends of the petiole of uninfected vines from which water was withheld. (B) Abscission zone at the stem/petiole junction. (C) Constriction and necrosis at the petiole/leaf blade junction. (A) Uniformly developed periderm of uninfected control. (B) Irregular periderm development of well-watered infected Chardonnay shoot, resulting in a green island. The PD symptoms of well-watered and water-stressed infected grapevines differed only in the presence or lack of green islands and the extent of the symptoms throughout the plant. Stems of water-stressed infected plants became woody before the well-watered plants. In infected plants, only the well-watered vines developed green islands (Figure 5B⇑), having an average of 2.1 ± 0.31 green islands per plant. The rates of cane ripening in uninfected and infected water-stressed vines were indistinguishable. The first PD symptom to appear was leaf scorch, which began with chlorosis at the margins of the leaves and moved toward the petiole in patches such that sections of necrosis were bordered by narrow regions of chlorosis (Figure 6A-D⇓). As symptoms progressed, leaf veins became dark brown (Figure 7A⇓), unlike the uninfected water-stressed leaf veins, which remained slightly green until the petiole and lamina became necrotic (Figure 1C⇑). Laminae of infected vines became completely necrotic, while the petioles remained green (Figure 7A, B⇓). Eventually laminae fell from the petioles to form matchsticks (Figure 7C⇓). Progressive development of leaf symptoms of PD. (A) Leaf-scorch symptoms began with chlorosis at the leaf margins. (B) Chlorosis moved toward the petiole in patches, such that sections of necrotic tissue were bordered by narrow regions of chlorotic tissue. (C, D) As symptoms progressed, leaf blades became totally necrotic, yet petioles remained green. (A) Necrotic leaf blade with a green and turgid petiole on infected vine. (B) Constriction and necrosis at the petiole/leaf blade junction, but no abscission zone at the stem/petiole junction. (C) Matchstick formed after the leaf blade dropped. 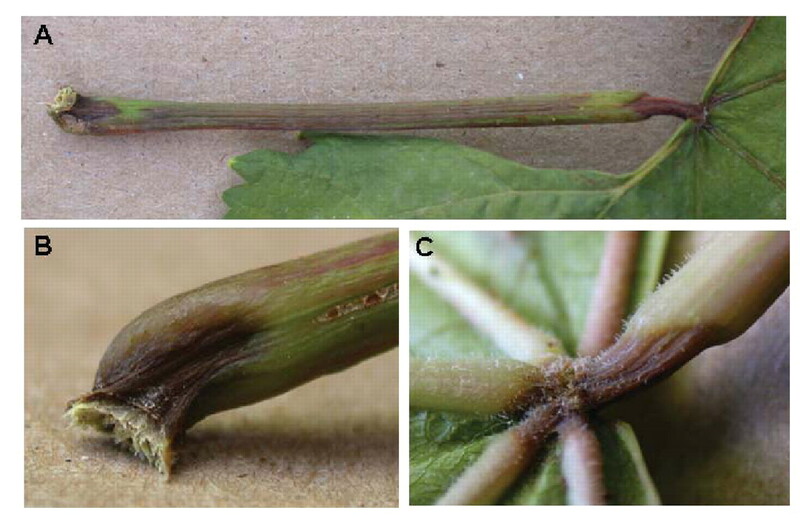 Abscission zones did not develop at the stem/petiole junctions of either well-watered or infected water-stressed plants; however, constriction and necrosis occurred at the petiole/lamina junction (Figure 7B⇑). Comparisons of the anatomy of this constriction site with the fracture zone at the petiole/lamina junction of un-infected water-stressed vines (Figure 2C, D⇑) showed that these fracture zones were identical. Vessel blockage in relation to PD symptoms. Experiments were conducted to test the dependence of leaf-scorch symptom development on the loss of vessel function by selectively severing veins to simulate xylem vessel blockage. All veins except one were severed such that a single secondary leaf vein connected the two halves of a lamina and was the sole water source for the nearly severed portion of the leaf (Figure 8⇓), and the plant was exposed to low (laboratory) or high (greenhouse) evaporative demand. Under low evaporative demand, stomatal conductance and transpiration of the nearly severed halves of the uninfected leaves were the same as the leaf halves that received more water, and neither half was statistically different from the uncut control leaves. In contrast, the stomatal conductance and transpiration of leaf halves of uninfected and infected vines experiencing high evaporative demand was at least 10-fold greater than that of the vines under conditions of low transpiration. The nearly severed halves of the leaves had significantly lower stomatal conductance and transpiration than the uncut leaves and the leaf halves having greater water availability, and there were no differences between the uninfected and infected treatments (Table 1⇓). Stomatal conductance and transpiration of uncut leaves and leaves 14 days after all veins but one were severed in each leaf such that a single leaf vein was the sole water source for the nearly severed portion of the leaf in healthy (−Xf) and Xf-infected (+Xf) grapevines in the greenhouse. Data are means ± standard error (n = 3–13); p = 0.05. Turgid leaf of uninfected Chardonnay 13 days after severance of all but one vein, resulting in a single leaf vein connecting and supplying water to half the leaf. Nearly severed leaf halves of vines experiencing low evaporative demand in the laboratory appeared turgid and showed no signs of necrosis for up to 36 days. Under medium to high evaporative conditions in the greenhouse, sections of leaves that received water via a single vein remained green and turgid for at least 30 days after the veins were severed (Figure 8⇑). That was true for leaves of infected and uninfected grapevines alike. Leaf-scorch symptoms of PD did not develop on any of the uninfected nearly severed leaves. Even when these leaf sections did eventually dehydrate after approximately two months, the symptoms were similar to those of water deficit and not similar to PD. PD symptom development during water deficit. At 30 days after inoculation (DAI), stomatal conductance of the well-watered plants of both infected and uninfected treatments was equivalent and significantly higher than that of the severely water-stressed treatment. Moderately water-stressed vines showed higher values than severely water-stressed vines and lower values than the well-watered vines, but not significantly so. There were no significant differences between infected and uninfected treatments at 30 DAI. At 91 DAI, stomatal conductance was somewhat higher in water-stressed treatments, but otherwise very similar to values 30 DAI (Figure 9A⇓). 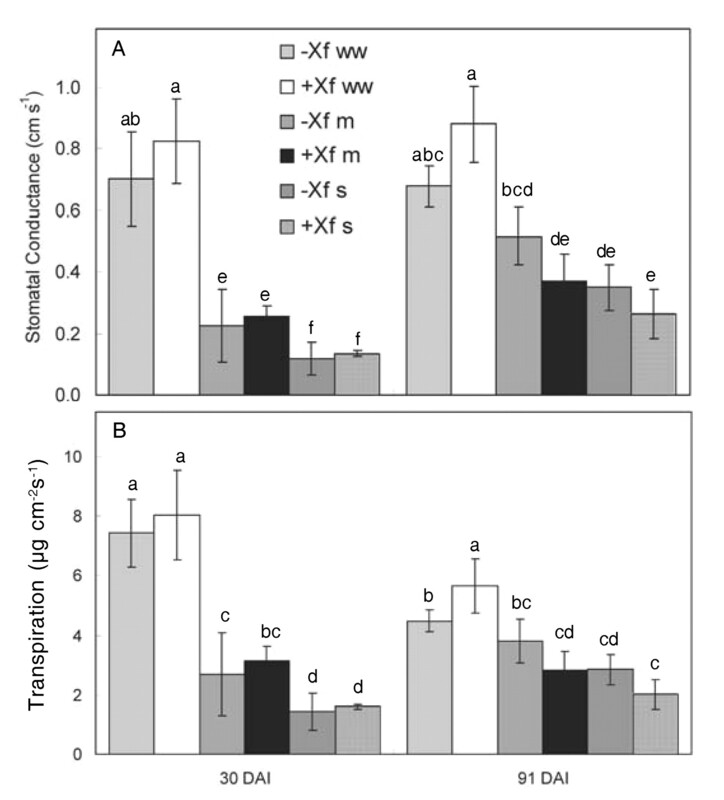 Transpiration rates showed the same relationships as stomatal conductance; well-watered vines had greater values than severely water-stressed vines, with the moderately water-stressed treatments falling in between. There were no significant differences between infected and uninfected vines in any of the water-deficit treatments (Figure 9A, B⇓). 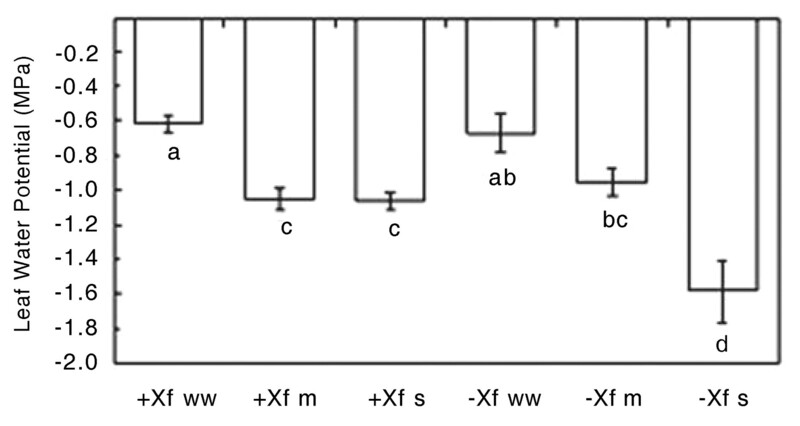 Stomatal conductance (A) and transpiration (B) of infected (+Xf) and uninfected (−Xf) Chardonnay vines subjected to three watering regimes: well watered (ww), moderate water deficit (m), or severe water deficit (s). Measurements taken at 30 and 91 days after inoculation (DAI). Data are means ± standard errors (n = 3–7). Same letters in each graph represent data that are statistically the same at p = 0.05. Plant water potentials of the infected and uninfected well-watered plants at 91 DAI were similar and higher than the water-stress treatments (Figure 10⇓). Similarly, the water potentials of the uninfected and infected moderately water-stressed treatments were equivalent. In contrast, the infected severely water-stressed vines had a higher water potential than the uninfected severely water-stressed vines despite receiving the same amount of water. An explanation could be that as the lamina of the severely water-stressed infected vines dropped from the petioles, evaporative water loss decreased, and so the plants may have been able to maintain a higher water potential than the equivalent uninfected treatment. There is also the possibility that the greater values of the infected severely water-stressed treatment were artificially high because only the few remaining (and therefore least) symptomatic of the leaves could be used for measuring water potentials. However, this seems improbable because leaves used for water potentials were allowed to equilibrate with the stem for 10 min so that the values reported were closer to stem water potential as opposed to leaf water potential. Thus, the water potential of the infected severely water-stressed vines is most likely accurate. Leaf water potential of infected (+Xf) and uninfected (−Xf) Chardonnay vines subjected to three watering regimes: well watered (ww), moderate water deficit (m), or severe water deficit (s). Data are means ± standard errors (n = 4–13). The same letters represent data that are statistically the same at p = 0.05. Although the plant water potentials of the infected vines in both the moderately water-stressed and severely water-stressed treatments were the same at 91 DAI, the tendency of the stomatal conductance and transpiration of the severely water-stressed infected vines to be lower than in the moderately water-stressed vines reflected the lower amount of water applied to the severely water-stressed plants. Interestingly, this same relationship was seen in the two water-stress treatments of uninfected vines even though the plant water potentials were significantly different, suggesting that soil drying may influence plant water relations independently of stem water potential. Overall, there was no significant difference in plant water relations between the infected and uninfected plants, except in the severely water-stressed vines (Figures 9⇑ and 10⇑). The first clear indications of leaf scorch were seen 48 DAI. Infected severely water-stressed vines developed more symptomatic leaves per plant than infected well-watered vines (Figure 11A⇓), although these differences were statistically significant only at 77 DAI. More of the infected water-stressed plants showed PD symptoms than infected well-watered plants at each sampling time (Figure 11B⇓). Compared to the infected well-watered vines, the moderate water-stress treatment had 3.5 times as many plants with symptoms, and there were over five times as many severely stressed plants that showed symptoms. By 77 and 91 DAI, all of the infected vines in the two water-stress treatments showed definitive and extensive signs of PD. Even after 91 DAI, nearly one-third of the well-watered vines showed no leaf symptoms (Figure 11B⇓). Pierce’s disease symptoms in infected Chardonnay vines in three conditions: well-watered (+Xf ww), moderate water deficit (+Xf m), or severe water deficit (+Xf s). (A) Severity of symptoms (1 = mild, 10 = severe). (B) Percentage of vines displaying PD symptoms for plants infected with X. fastidiosa. Data are means ± standard errors (for A, n = 4–7; for B, n = 5–10). The same letters in each graph represent data that are statistically the same at p = 0.05. Uninfected vines exhibited no symptoms and data are not shown. Interestingly, the leaf-scorch and matchstick symptoms in the well-watered infected plants had the same visual characteristics as in the water-stressed infected plants; the only differences were in the number of plants showing symptoms and the extent to which the disease had spread throughout each plant as determined by leaf-scorch symptoms and matchsticks. The results revealed that visual symptoms of PD of grapevine are qualitatively and quantitatively different than those of various water deficits. 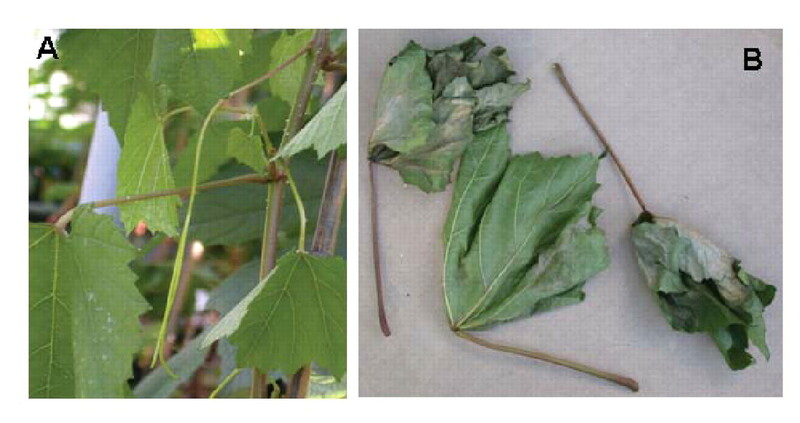 Vines infected with Xf showed a number of PD-specific symptoms, including irregular periderm development on stems (green islands), leaf abscission at the leaf blade/petiole junction (matchsticks), and patchy leaf necrosis. Neither of the diagnostic PD characteristics—matchsticks and green islands (Goheen and Hopkins 1988, Goodwin and Purcell 1992, Newman et al. 2004)—were observed in grapevines exposed to water deficits nor have they ever been reported to develop as a consequence of water deficits. 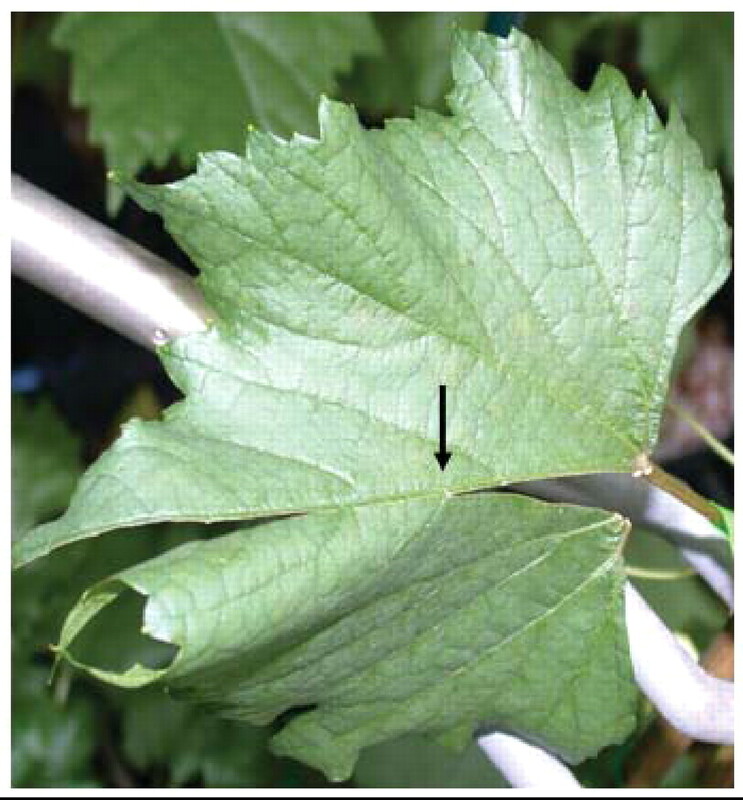 The characteristic tendril and leaf wilting of grapevines at low water status was not observed in infected well-watered plants that were otherwise symptomatic of PD. (Leaf wilting is observed in greenhouse grapevines but seldom in field-grown plants.) 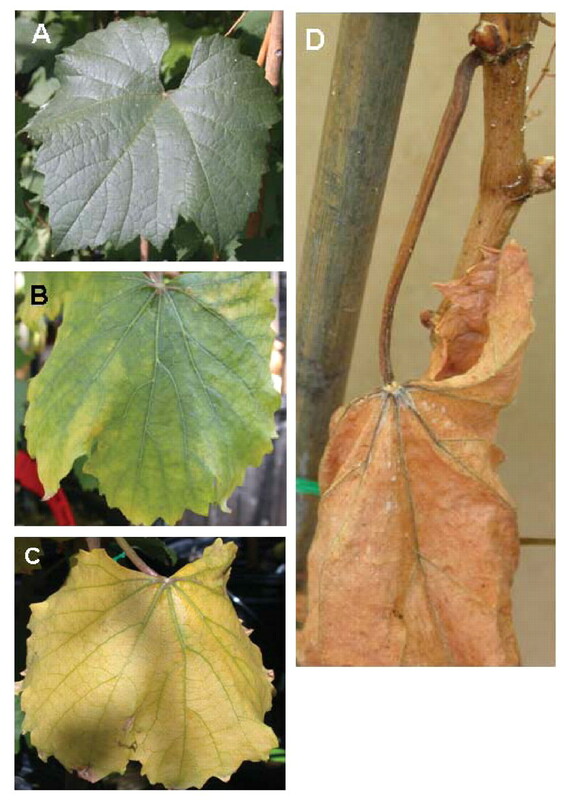 Although loss of chlorophyll in leaves was apparent under both slowly developing water deficits and PD infection, the nature of leaf chlorosis in vines at low water status and in vines infected with PD was clearly dissimilar. The differences in the symptoms that develop in response to these environmental stimuli suggest that factors other than restricted water transport contribute to the pathogenicity of Xf infection. Nevertheless, water deficits exacerbated the development of PD symptoms. Grapevine stems “ripen” beginning at the basal portion of the stem and proceeding acropetally. Water deficits and PD had opposite effects on this process. Water deficits accelerate the acropetal development of periderm on stems (present study, Matthews et al. 1987). Infection with Xf inhibited, in an irregular manner, the development of periderm, giving rise to green islands, which remain green because the phellogen fails to form completely around the circumference of the phloem and seal off the epidermis (Stevenson et al. 2005). The incomplete phellogen development may be related to altered endogenous cytokinins, which respond to the presence of bacterial pathogens (Jameson 2000). Green islands were observed only in infected well-watered vines and not in infected vines exposed to water deficits, suggesting that the acceleration of periderm development caused by low vine water status masked or eliminated the inhibitory effect on periderm development of PD. However, there may have been no direct interaction because the response to water deficits probably occurred before the response to Xf. The development of PD symptoms is slow, requiring months under the greenhouse and inoculation conditions used in this study (Stevenson et al. 2004b). In these plants, inoculation occurred at the same time as the withholding of water, and PD symptoms developed well after the onset of low leaf water potentials. Thus, phellogen initiation may have been induced ahead of plant responses to the presence of the bacteria, preventing the expression of green islands in vines at low water status. In subsequent growing seasons when the bacteria and disease become systemic, green islands may become apparent earlier in shoot development and prior to water deficits, although it is yet to be determined whether the green islands of PD are associated with a localized bacterial colony. Also, green islands were not observed in all infected plants at high water status, and green islands were the last of the classic PD symptoms to develop. These results are important in demonstrating that expression of the green island symptom is dependent upon other environmental factors in addition to the presence of Xf, potentially diminishing its utility as a diagnostic. Leaf drop occurs during water deficits and during PD, and Goodwin et al. (1988b) concluded that the leaf drop of PD infection was the consequence of water deficit that accelerated normal leaf senescence. However, the results of this study show distinctly different processes at work during water deficits and PD. 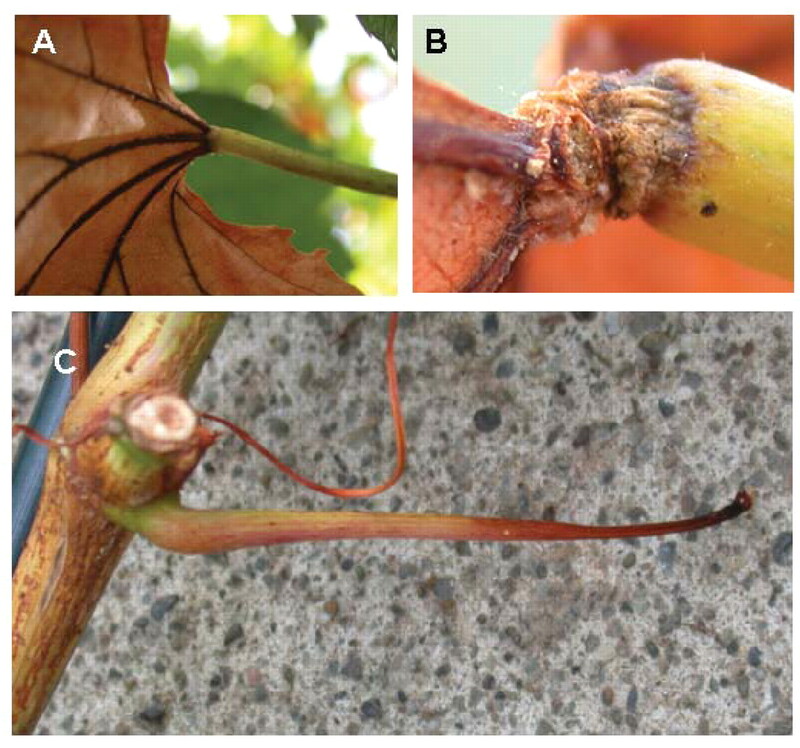 A true abscission zone was formed at the basal ends of petioles (the stem/petiole junction) at basal stem positions in uninfected vines subjected to water deficits. The abscission zone was distinguished by the distinctive layers of cell division and separation (a region of cell expansion and a protective layer, respectively) that are indicative of programmed abscission (Mauseth 1988). Basal leaves of plants at low water status always separated from the stem at the abscission zone. Conversely, an abscission zone did not develop at either end of petioles in infected vines regardless of water status nor were any of the changes in cell development associated with abscission zones observed. Rather than an abscission zone, a fracture zone of degenerating cells formed at the apical end of the petiole (leaf blade/petiole junction) (see Stevenson et al. 2005). Symptomatic leaf blades nevertheless separated completely from the apical ends of petioles of infected vines such that the petiole remained green and attached to the stem after the leaf blade had separated and fallen off. The lack of a basal abscission zone in infected petioles and the separation of the petiole from the blade rather than from the stem indicate that different mechanisms cause leaf drop during water deficits and during PD, rather than water deficits causing leaf abscission during PD. As rapid water deficits developed in uninfected vines, leaves wilted and a similar fracture zone was sometimes observed at the apical end of petioles, but matchsticks did not form. Leaf wilting in grapevine is unusual in the field, but there are evidently cells at the apical junction that respond to water deficits with large volume changes that decrease the angle made by the petiole and leaf blade (Smart 1974). This tissue may be more susceptible to water deficits or mechanical stress than other areas and deserves further investigation. Thus, the fracture zone may simply be a result of structural weakness of cells in that region (Stevenson et al. 2005). On the other hand, the fracture zone at the apical end of petioles occurred in infected vines at high and low water status and in healthy uninfected vines at low water status. This observation shows that degeneration at the petiole/leaf blade junction is a plant response that is shared among stresses (rapid water deficits, PD) and suggests that parts of the signaling and metabolic pathways involved are also shared. The chlorosis induced by water deficits and by PD was not similar. Leaves of vines exposed to water deficits displayed uniform leaf chlorosis (and reduced stomatal conductance), whereas symptomatic leaves of infected vines, regardless of water status, displayed localized bands of chlorosis bordering areas of marginal necrosis. The chlorosis caused by water deficits is similar to, if not the same as, that which appears during normal leaf senescence. The chlorosis of PD is irregular, leaving patches of green tissue with high stomatal conductance (Goodwin et al. 1988b), and progresses rapidly to irregular necrosis that is not generally observed during leaf senescence of uninfected plants. Also, in the field, water deficits induce accelerated leaf senescence beginning with the oldest leaf at the shoot base and progressing acropetally (Williams and Matthews 1990), whereas PD symptoms usually appear near the middle of the shoot and progress in both directions (Goheen and Hopkins 1988, Goodwin and Purcell 1992). The different patterns of location of chlorotic and necrotic symptoms among and within leaves exposed to water deficits compared to leaves exposed to PD indicate that either different mechanisms give rise to the symptoms or the site of water deficit or xylem occlusion is different in vines exposed to soil water deficits and to PD. Thus, knowledge of the site and nature of any occlusions and their relationships to water deficits and visual symptoms is important for understanding the cause of the disease symptoms that are attributed to water deficits. Pierce’s disease causes reduced hydraulic conductance of stem segments (Goodwin et al. 1988b), and it has been suggested that the localized leaf symptoms of PD were due to xylem conduit blockage in the nodes and petioles (Goodwin et al. 1988a,b). Vessel occlusions develop during PD (Fry and Milholland 1990, Mollenhauer and Hopkins 1976), but the role of the occlusions in disease and water deficits has not been clarified. It is possible that, because of limited lateral connectedness, regions of leaf blade are dependent upon particular vascular traces in the stem, node, or petiole, and the phenomenon of patchy stomatal closure could be interpreted as evidence of this (Buckley and Mott 2000). However, the vascular anatomy of internodes, the subtending node, and petiole is relatively straightforward, with four to eight traces diverging in the node subtending the leaf (Stevenson et al. 2004a). An increased frequency of tylose development in stem vessels was observed following inoculation with Xf, but there was no evidence of localized occlusions in nodes (Stevenson et al. 2004b). Localized occlusions remain a possible source of localized differences in water transport into the leaf blade if water transport to various leaf tissues is highly dependent on specific stem or petiole vascular bundles. Xylem vessels in stems and leaves of PD-infected plants may become obstructed by bacteria, bacterial gum, tyloses, and plant-generated gum. In anatomical investigations of plants inoculated and cultured similarly to those in this study, Stevenson et al. (2004b) reported that vessel occlusions by bacteria and gum in infected vines were initially restricted to the petiole and leaf blade, with low populations of bacteria in stems of symptomatic vines observed within the first few months following inoculation. This pattern of earlier and more occlusions in the leaf is commonly observed (Purcell and Hopkins 1996). Thus, the occlusions that develop do so initially in the leaves where visual symptoms follow. While vessel occlusion will reduce hydraulic conductance, no studies have effectively examined whether xylem blockage influences leaf-scorch symptom development. It is not clear how much water-transport capacity in the leaf must be lost in order to generate localized water deficits, how much localized water-transport capacity is lost during PD infection, and finally, how much localized water deficit would be necessary to produce localized chlorosis and necrosis. Tissue water status temporarily decreases upon excision of entire, individual minor veins, but recovers within 10 to 20 min (Omasa et al. 1991). When reported, the extent of colonization of conduits in symptomatic grape leaves during Xf infections has been variable but usually low. Mollenhauer and Hopkins (1974, 1976) found that in cross sections of leaf-scorched grape no more than 40% of vessels contained bacteria. Recently, Newman et al. (2003) evaluated the colonization of vessels in petioles of symptomatic and asymptomatic leaves on infected vines. The frequency of colonized vessels was much greater in symptomatic leaves than in asymptomatic leaves, but less than 15% of vessels in the petioles of symptomatic leaves were colonized by Xf, and only an estimated 2% were completely blocked. Furthermore, the severity of leaf-scorch symptoms in infected plants was not correlated to the number of colonized vessels in citrus, although it was in coffee and plum (Alves et al. 2004). However, Hopkins (1981) reported that 80% of vessels in marginal leaf segments of symptomatic Vitis labrusca were occluded and argued that the evaluation of occluded vessels in cross section greatly underestimates the number of occluded vessels. Yet, in this study, a single second-order vein near the leaf tip was sufficient to supply water to half of a leaf and avoid wilting and chlorosis for many weeks. Although both phloem and xylem conduits were eliminated in that experiment, the results showed that vessel occlusion may not be sufficient to cause some PD symptoms. Indeed, it has long been recognized that the vasculature of leaves is capable of accommodating a large degree of vessel dysfunction while maintaining necessary water transport (Wylie 1921). Wylie (1927) was investigating adaptation to herbivory and wind damage, and more recent work has focused on the problem of embolisms (Sack et al. 2003), but our results show that the apparent propensity for the vasculature to be overbuilt may have developed in part to facilitate survival of remaining tissue upon invasion by vascular pathogens such as Xf. With a sufficiently overbuilt hydraulic system, plant responses to infection that could restrict water transport, including the production of gums and tyloses, are also potential resistance mechanisms that restrict bacterial movement (Fry and Milholland 1990). For example, Mollenhauer and Hopkins (1976) found considerably more vessels occluded with tyloses and gums in infected species that are resistant to PD than in species that are susceptible to PD. The avoidance of chlorosis and necrosis upon the extreme reduction of functional vessels that was artificially induced in this study by severing leaf veins demonstrates that xylem vessel blockage—whether because of plant gels, bacterial gums, tyloses, or bacterial bodies—is not solely responsible for leaf-scorch symptoms. Occluded xylem vessels may worsen leaf scorch, but other factors contribute to PD symptoms. And, given the low frequency of vessel colonization in symptomatic leaves, in order for localized water deficits to develop, a hypothesis that tyloses or gums develop in vessels that are not colonized would be required. This scenario involves the tacit assumption of a signal moving from the bacteria to the site of occlusion or other action. It is noteworthy then that exogenous ethylene caused gum development similar to that in response to Fusarium infection in castor bean leaves (VanderMolen et al. 1983) and that ethylene is overproduced by infected leaves of grape (John Labavitch, unpublished data, 2005). Ethylene is implicated in programmed cell death (Yamada and Marubashi 2003), which has been suggested as a cause of necrotic symptoms in several plant diseases, including in Xf-infected plants (Gilchrist 1998). In addition to a diffusible plant signal such as ethylene, a bacterial toxin, although thought unlikely by some (Purcell and Hopkins 1996), cannot be ruled out. Indeed, there is a recent report of two phytotoxins being recovered from Xf culture filtrate (Lu et al. 2003). PD symptom development during water deficits. Water deficits resulted in a faster and more extensive onset of leaf symptoms than in well-watered Xf-infected vines. There were no other differences noted in symptom progression. Although there are no previous reports of interactions between grapevine water status and PD development, similar results were observed with Xf infections of citrus (Gomes et al. 2003) and Virginia creeper (McElrone et al. 2003). The more rapid progression of matchstick and leaf-scorch symptoms in infected vines at low water status than in infected vines at high water status suggests that the bacteria spread more rapidly throughout the plant at low water status. The mechanism by which bacteria move presumably involves breaching pit pore membranes between vessels (Newman et al. 2004). Water deficits increase the frequency of cavitation, and repeated exposure to water deficits may increase the propensity for disruption of pit pore membranes (Stiller and Sperry 2002). Thus, if water deficits in grapevine cause failures of pit membranes, tissue water status may be of fundamental importance in Xf movement among vessels. However, the role that pit membranes play in limiting movement has not been clearly established; vessel length distribution and bacterial interaction with the secondary cell wall of the vessel may also be important factors. Water deficits accelerate and exacerbate PD symptom development. The symptoms of PD are qualitatively and quantitatively different than the symptoms of water deficits. Therefore, the widely accepted hypothesis that PD symptoms—green islands, matchsticks, localized leaf scorch, and eventual death of vines—arise from xylem occlusions and resultant water deficits deserves further scrutiny. Acknowledgments: This work was funded by the California Department of Food and Agriculture, agreement nos. 01-0712 and 03-8500-0503-GR, and by USDA/CREES grant no. 2003-34442-13148. The authors thank Cal-Western Nurseries, Visalia, CA, for their gift of quality grapevines, and Ngoc-Mai Nguyen for technical assistance. ↵5 present address: Department of Biology and Chemistry, Texas A&M International University, Laredo, TX 78041. Alves, E., C.R. Marucci, J.R.S. Lopes, and B. Leite. 2004. Leaf symptoms on plum, coffee and citrus and the relationship with the extent of xylem vessels colonized by Xylella fastidiosa. J. Phytopathol. 152:291–297. Buchner, R., A.E. Fulton, and K.A. Shackel. 2003. Irrigation management for California walnut. HortScience 38:657–658. Buckley, T.N., and K.A. Mott. 2000. Stomatal responses to nonlocal changes in PFD: Evidence for long-distance hydraulic interactions. Plant Cell Environ. 23:301–309. California Agricultural Research Priorities: Pierce’s Disease. 2004. Committee on California Agriculture and Natural Resources, National Research Council. National Academies Press, Washington, DC. Fry, S.M., and R. Milholland. 1990. Response of resistant, tolerant, and susceptible grapevine tissues to invasion by the Pierce’s disease bacterium, Xylella fastidiosa. Phytopathology 80:66–69. Gilchrist, D.G. 1998. Programmed cell death in plant disease: The purpose and promise of cellular suicide. Ann. Rev. Phytopathol. 36:393–414. Goheen, A.C., and D.L. Hopkins. 1988. Pierce’s disease. In Compendium of Grape Diseases. R.C. Pearson and A.C. Goheen (Eds. ), pp. 44–45. American Phytopathological Society Press, St. Paul. Goheen, A.C., G. Nyland, and S.K. Lowe. 1973. Association of a rickettsia-like organism with Pierce’s disease of grapevines and alfalfa dwarf and heat therapy of the disease in grapevines. Phytopathology 63:341–345. Gomes, M.M., A.M.M.A. Lagôa, E.C. Machado, and C.L. Medina. 2003. Abscisic acid and indole-3-acetic acid contents in orange trees infected by Xylella fastidiosa and submitted to cycles of water stress. Plant Growth Regul. 39:263–270. Goodwin, P.H., J.E. DeVay, and C.P. Meredith. 1988a. Roles of water stress and phytotoxins in the development of Pierce’s disease of the grapevine. Physiol. Mol. Plant Pathol. 32:1–16. Goodwin, P.H., J.E. DeVay, and C.P. Meredith. 1988b. Physiological responses of Vitis vinifera cv. Chardonnay to infection by the Pierce’s disease bacterium. Physiol. Mol. Plant Pathol. 32:17–32. Goodwin, P.H., and A.H. Purcell. 1992. Pierce’s disease. In Grape Pest Management. D.L. Flaherty (Ed. ), pp. 76–84. University of California, Agriculture and Natural Resources, Oakland. Hopkins, D.L. 1981. Seasonal concentration of the Pierce’s disease bacterium in grapevine stems, petioles, and leaf veins. Phytopathology 71:415–418. Hopkins, D.L. 1989. Xylella fastidiosa: Xylem-limited bacterial pathogen of plants. Ann. Rev. Phytopathol. 27:271–290. Jameson, P. 2000. Cytokinins and auxins in plant-pathogen interactions: An overview. Plant Growth Regul. 32:369–380. Kramer, P.J., and J.S Boyer. 1995. Water Relations of Plants and Soils. Academic Press, San Diego. Lu, J., X. Xu, Z. Ren, H. Yun, and X. Liu. 2003. Interaction between the pathogen and host plants during Pierce’s disease development of grapevines. HortScience 38:687–688. Matthews, M.A., H.R. Schultz, and M.M. Anderson. 1987. Phenologic and growth responses to early and late seasonal water deficits in Cabernet franc. Vitis 26:147–160. Mauseth, J.D. 1988. Plant Anatomy. Benjamin Cummings, Menlo Park, CA. McElrone, A.J., J.L. Sherald, and I.N. Forseth. 2001. Effects of water stress on symptomatology and growth of Parthenocissus quinquefolia infected by Xylella fastidiosa. Plant Dis. 85:1160–1164. McElrone, A.J., J.L. Sherald, and I.N. Forseth. 2003. Interactive effects of water stress and xylem-limited bacterial infection on the water relations of a host vine. J. Exp. Bot. 54:419–430. Mollenhauer, H.H., and D.L. Hopkins. 1974. Ultrastructural study of Pierce’s disease bacterium in grape xylem tissue. J. Bacteriol. 119:612–618. Mollenhauer, H.H., and D.L. Hopkins. 1976. Xylem morphology of Pierce’s disease-infected grapevines with different levels of tolerance. Physiol. Plant Pathol. 9:95–100. Moore, R., W.D. Clark, and D.S. Vodopich. 1998. Botany. 2d ed. McGraw-Hill, New York. Newman, K.L., R.P.P. Almeida, A.H. Purcell, and S.E. Lindow. 2003. Use of a green fluorescent strain for analysis of Xylella fastidiosa colonization of Vitis vinifera. Appl. Environ. Microbiol. 69:7319–7327. Newman, K.L., R.P.P Almeida, A.H. Purcell, and S.E. Lindow. 2004. Cell-cell signaling controls Xylella fastidiosa interactions with both insects and plants. Proc. Natl. Acad. Sci. U.S.A. 101:1737–1742. Omasa, K., S. Maruyama, M.A. Matthews, and J.S. Boyer. 1991. Image diagnosis of photosynthesis in water-deficit plants. In Mathematical and Control Applications in Agriculture and Horticulture. Y. Hashimoto and W. Day (Eds. ), pp. 383–388. Pergamon Press, Tokyo. Purcell, A.H. 1986. Pierce’s disease. In Grape Pest Management. D.L. Flaherty (Ed. ), pp. 62–69. Pub. 4105. Cooperative Extension University of California, Division of Agriculture and Natural Resources, Oakland. Purcell, A.H., and D.L. Hopkins. 1996. Fastidious xylem-limited bacterial plant pathogens. Ann. Rev. Phytopathol. 34:131–151. Ruzin, S.E. 1999. Plant Microtechnique and Microscopy. Oxford University Press, New York. Sack, L., P.D. Cowan, and N.M. Holbrook. 2003. The major veins of mesomorphic leaves revisited: Tests for conductive overload in Acer saccharum (Aceraceae) and Quercus rubra (Fagaceae). Am. J. Bot. 90:32–39. Smart, R.E. 1974. Aspects of water relations of grapevine. Am. J. Enol. Vitic. 25:84–91. Stevenson, J.F., M.A. Matthews, and T.L. Rost. 2004a. Grapevine susceptibility to Pierce’s disease I: Relevance of hydraulic architecture. Am. J. Enol. Vitic. 55:228–237. Stevenson, J.F., J.M. Labavitch, M.A. Matthews, and T.L. Rost. 2004b. Grapevine susceptibility to Pierce’s disease II: Progression of anatomical symptoms. Am. J. Enol. Vitic. 55:238–245. Stevenson, J.F., M.A. Matthews, and T.L Rost. 2005. The developmental anatomy of green islands and matchsticks as symptoms of Pierce’s disease of grapevines. Plant Dis. 89:543–548. Stiller, V., and J.S. Sperry. 2002. Cavitation fatigue and its reversal in sunflower (Helianthus annuus L.). J. Exp. Bot. 53:1155–1161. VanderMolen, G.E., J.M. Labavitch, L.L. Strand, and J.E. DeVay. 1983. Pathogen-induced vascular gels: Ethylene as a host intermediate. Physiol. Plant. 59:573–580. Williams, L.E., and M.A. Matthews. 1990. Grapevine. In Irrigation of Agricultural Crops. B.A. Stewart and D.R. Nielsen (Eds. ), pp. 1019–1055. American Society of Agronomy, Madison. Wylie, R.B. 1921. Concerning the capacity of foliage leaves to withstand wounding. Proc. Iowa Acad. Sci. 28:293–304. Wylie, R.B. 1927. Leaf structure and wound response. Science 65:47–50. Yamada, T., and W. Marubashi. 2003. Overproduced ethylene causes programmed cell death leading to temperature-sensitive lethality in hybrid seedlings from the cross Nicotiana suaveolens x N. tabacum. Planta 217:690–698.